Most developers have heard of Ajax by now. Unless you've worked with it, you probably think it's another complicated form of alphabet soup. It actually turns out to be quite easy to use from AppStudio. 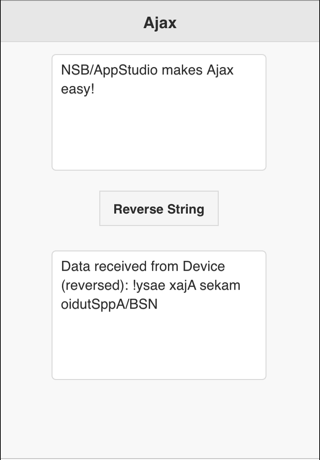 Ajax makes it easy to exchange data with your server. Think of it as a function you can call that is running on another system. You can pass it parameters and it can return values. Since it's running on your server, it can do things that you cannot do on your device. It can access files and databases on the server, or get data from other web sites without worrying about Same Origin Policies. You will need to use a server with PHP enabled to run these samples. The AppStudio Server does not have PHP enabled. 13 Using AJAX to get info from a database on your server. The PHP script is even easier. 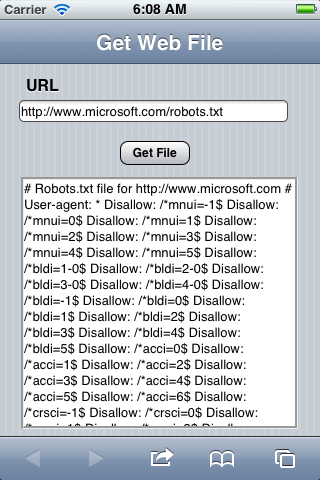 It gets the input that is named myText, reverses it, and uses the echo statement to send it back. The php script needs to be on the same folder on the server as the AppStudio app. Ajax is based on XMLHttpPost. A handy way to return data from your PHP script is in JSON format. PHP even has a handy json_encode() function. PHP is not enabled on the AppStudio Server. Let's extend what we are doing a bit and talk about using the POST method. We discussed the simplest Ajax call, which sends data to the server by adding it to the end of the URL, a method called, rather misleadingly, GET. But what if we want to send more data? GET has a limit, some say, of around 2000 characters. For more than that, we'll use the also badly named POST method. POST has an upload limit on most servers of 8 megabytes. If you need more, server settings can be adjusted. //make sure permissions are all OK! One of the basic security features of the modern web is the Same Origin Policy. It states that a web app cannot pull up just any data from another site. This becomes a problem if you need data on someone else's site. While a web app isn't allowed to access the files on another site, a PHP script is. We'll get our PHP script to do the dirty work for us and return the results to our app. The technique we will use is often called scraping. Time to look at some code again. Here's the AppStudio part that calls the PHP script. It looks very much like the code in A Simple Exchange of Data with the server above. The main difference is that we're calling a different PHP script. $_GET('urlToGet') gets the parameter string that was attached to the URL in our AppStudio code. _file_get_contents get the contents of the file, in this case, the URL that was passed. echo sends the result back to our AppStudio program. There is a simpler way to do this, but it can run into security problems. If your app is going to communicate with your server while it is running, you've probably wondered how much your app will slow down when it has to wait for the server. SysInfo(10) is the current time in milliseconds. Limit is the time we want run to. You can run this test for up to about 5 seconds: after that, the system will think you are in a endless loop and shut you down. It's obvious that the speed that really depends on what kind of connection you have to the web. A hard wire to your router gets the best time. WiFi is much slower, and 3G is slower again. No real surprise here. In our last Ajax discussion, we discovered that it could take half a second for an Ajax call to complete (actually, due to network latency, it could even be a lot more than that.) How do we do Ajax calls and not make our app look slow? Easy. We send the Ajax message off, then go do other stuff. When the response comes back, we respond to it. This is called Asynchronous operation. 'done' will actually be called several times with progress reports on the call. We only care if it completes, so we wait for req.readyState to be 4. The rest of our function works just like when we were not asynchronous. One of the uses of this technique that we see every day is to return partial results on a search field (as in Google). Each time a character is entered, it is sent to the server for a list of possible matches. As the results come back, the window is updated. Entering characters in the field is unaffected by the server communications that are going on at the same time. 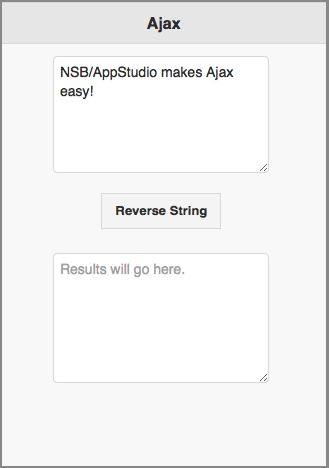 Check out the AjaxAsync app in the Samples to see this in action. The result is that your PHP files will be placed on the server, in the same folder as your app. Your app can call a PHP script by just giving the file name - no path name will be needed. Let's use this to get a stock quote from Yahoo. There are 3 parts to this: first, we have to make the request. Next, we handle the return. Finally, we execute the function. Yahoo! has a very powerful API to look up all kinds of data. To make it easier, they have set up an interface using SQL like statements called YQI. In our code above, we start by creating our YQI request. The encodeURIComponent() function translates special characters and spaces so they can be sent in our Ajax call. URL is then composed of our YQI request with the rest of the boilerplate that is needed. The most interesting part is the &callback part. It names the function that the return values will be wrapped in. Having prepared everything, we can inject the script. This is a valid function call, so when it is run, the function is executed. The Eval() function causes requestComplete() to be called. The data that comes back is a fairly complex structure with a lot of data in it. You can copy it to the NotePad to see everything that is there. For now, we are just interested in the asking price of the stock. The results are returned in an array, with one element per stock. There are many web services that work in a similar fashion. One of the tip offs is if the calling string has an &callback argument. If it does, it probably can be used with this method. Some of these services are free or limited, while others require an API key that you must obtain from the service. Got more? Let us know at support@nsbasic.com. A lot of the discussion in this Tech Note has been ways to get around Same Origin Policies. Can we get rid of this restriction? We can, but there's a catch. To allow a PHP script on your server to give its results to apps which were not loaded from your server, add this line as the first line of your script. The catch is that now anyone with an internet connection can run your PHP script. Using AJAX to get info from a database on your server. Since AppStudio runs on your device, it cannot directly access files or databases on another computer, such as a server. It need to communicate with an app running on the server, which gets the information from the database and returns it. There is no parsing of the incoming query string, so someone could conceivably put some malicious code in there ("SQL Injection") and you may want to determine that the person requesting the info is authorized to do so. For a more detailed description, see this article: http://www.raywenderlich.com/2941/how-to-write-a-simple-phpmysql-web-service-for-an-ios-app. Receive a response from the server and do something with it. This is a mod of the original Camera Sample file. You must have the supplied PHP files in the same location as the AppStudio production files. To control when a pic may be sent or that a pic is not sent multiple times by click happy users, btnSubmitImages is placed in different states of visiblility and/or usability by way of the SentFlag. Note: PictureBox1 is in the negative left of the form. This is a trick that developers use to hide controls from the users but still have availability to them. 'Next, let's read start reading it in. 'Now, let's load it into an image. 'The _onload function for the image will be called on completion. 'still no solution it the iOS distortion. 'is pushed more than once. 'image or the speed of the internet connection. '(i.e. the btn value change and the label caption change. lblPicMsg.textContent =  "Need to take a pic first"
Many websites have information that can be retrieved using AJAX. The best list we have found is on Programmable Web. When running as a PhoneGap app, your program is no longer tied to the server it was downloaded from. As a result, it doesn't know where to go on the web. You need to make two changes to any of the above samples to make them work as PhoneGap apps. This page was last edited on 6 July 2017, at 21:47.